We’ve been able to spread the word to multiple outlets. The online media space is becoming an increasingly unfriendly one in this day and age, but it is certainly encouraging to see that other organizations that are aiming to spread some positivity to combat the negative vibes. Check out Steph's interview with Think Before You Type, an anti-cyberbullying and positive self-esteem nonprofit organization! Read The Loop HK's 30 under 30 feature on Steph, a feature series that highlights young people who are doing cool things in their respective fields of interest! Our feature on Inspirational Women Series, where Steph talks about why she started Body Banter, why we encourage vlogs, why body image issues matter, and MORE! 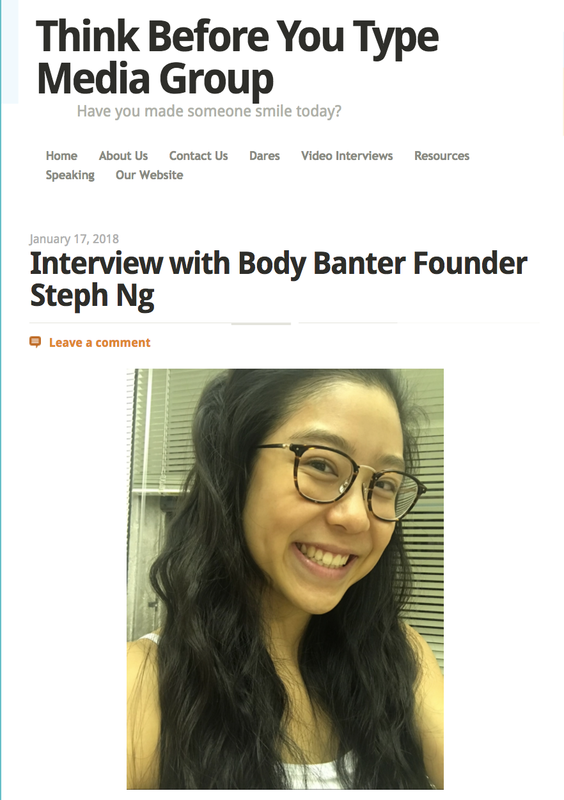 Check out our feature on South China Morning Post Young Post, where our founder Steph discusses what Body Banter is all about!